Because seven just wasn't enough. Hot on the heels of the announcement that Europe would be seeing a range of new Xbox 360 bundles - three of which we already knew about - comes new that there'll be an eighth hardware bundle for the Holiday season. 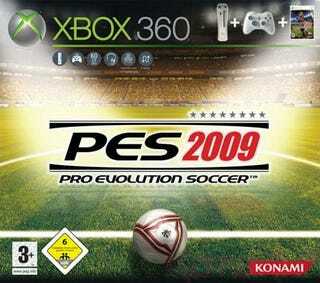 This one includes a 60GB Pro, a single controller and a copy of Pro Evo 2009, which you'll get for £190/€270. The bundle will be available in Austria, Greece, Hungary, Italy, Netherlands, Portugal, Spain, and the UK, and will go on sale on October 24.